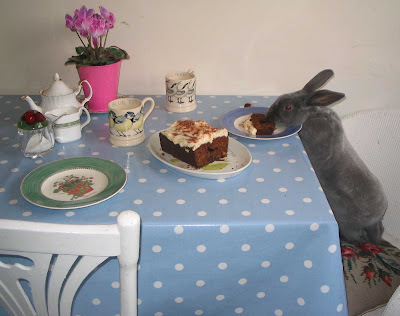 Please pull up a chair and join Captain Rupert and I for a cup of tea and slice of carrot cake (his favourite). We are so please to have made room for a kitchen table, by getting rid of the old rayburn and removing a few cupboards and getting a fridgefreezer. Captain Rupert is siting on a old loydloom, tucked in the corner. Well captain Rupert enjoys music, he loves sitting between the speakers in the living room and his ears twitch in time to the music. A particular favourite is of his is to listen to last night of the proms. Well Captain Rupert is not too interested in toys preferring to go on real adventures, he has been getting on very well with Hopplesham. 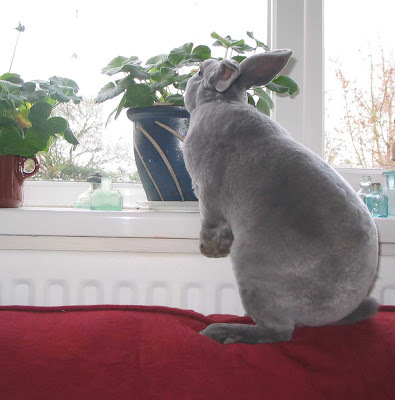 Carrot cake is his favourite, nice pretty plants, Toast, pears/apples and nokia phone chargers - just too iristable. Running and hopping and climbing, eating and jumping and watching out for things on my patch, taunting next doors dogs through the fence and after all that finding a nice place to sit down rest and watch the world go by. Oh that might be more than five. 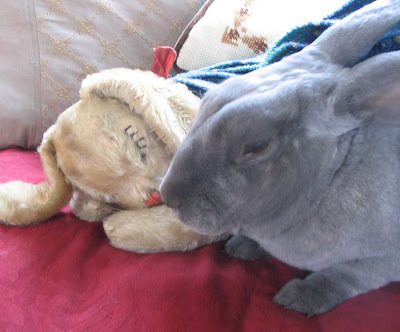 Captain Rupert is a rabbit and a Captain at that so could not possible have any bad habbits. His house trained, he does not make a habbit of eating wires or wooden furniture, he only nibbles bags if we put them in the way of his make shift burrow behind the sofa. His happy in the garden all day talking to the birds. He would like to tag, because he can decide not like me. But don't worry about doing the tagg if you don't have time. Today is so grey and miserable, I can't even see the Downs or the field at the end of the garden. 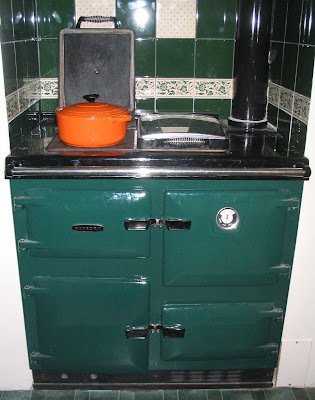 We are nice and warm though, thanks to our Rayburn. 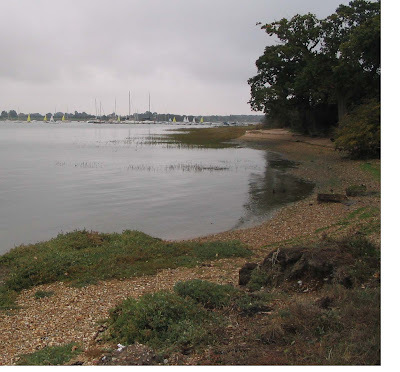 The picture above is Chichester Harbour on a cold Autumn day a few weeks ago. I love going for walks on cold days so you can come back to warm up in front of the fire with a nice cup of tea, made in a teapot and a piece of cake. I had to take a picture of the last of the glowing embers of the last fire we had in the solid fuel rayburn just so I could be reminded. 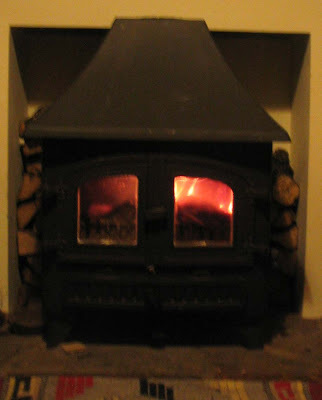 I miss the little fire, it was so warm and cosy and made a lovely little comforting noise. The new rayburn is in place and just about working, I can't begin to say what an ordeal it has been. We even nearly missed a siting of a Barn Owl on a walk because we had been too busy moaning about the chap who fitted it for us. It is so exciting having on and off heating and hot water. The house feels much better for it too. 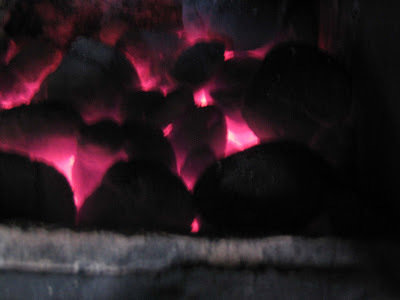 Its not that I like to have loads of heat but having it all thermostatically controlled, is so much better than arriving home at mid night and having to make a fire just so there is hot water in the morning. Or going outside and finding dry kindling, or sitting in front of it willing the fire too light. It was a kind of love hate relationship with the old rayburn. The new rayburn has pressure jet burners so only burn when needed and this hopefully means we will burn less oil. I was very lucky, to find a five year old one for a a very good price in the free adds. Otherwise we had been think about getting the old one converted which is apparently not as efficient and much noisier. Its noisy enough while the burners are on. I hope we have made the right decision. The other exciting thing is we created all this space in the kitchen. 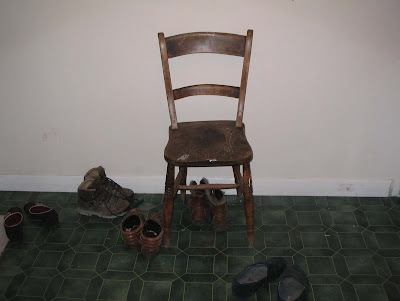 For 5 months we had the old and the new rayburns sitting in our little kitchen. What to do with all this space......well I'm going to save that for another post. 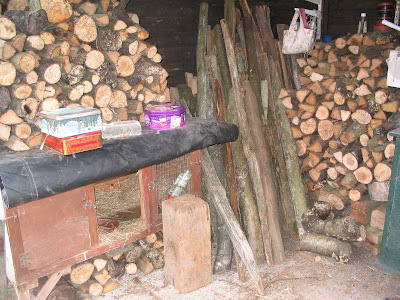 Since now we did not need so much wood the wood fairy decided to visit and left us with stacks of wood. Which Captain Rupert guarded over. Hopplesham bunny arrived with my parents and a chain saw, to chop all the wood up. My parents helped us out with finishing of lots of out standing DIY, which was worrying K. Thank you very much to my parents for all your help. Hopplesham is an old favourite I used to play with him all the time at my grandmas. He used to belong to my aunt. 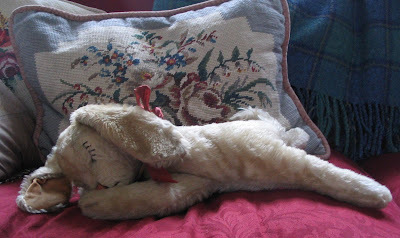 I thought it was about time he came to live with us after seeing Michelle's lovely rabbit collection. Hopplesham is a stieff with a bell in his tail, but no button in his ear. I think this has long been removed due to a believe that it is cruel to pierce animals ears. 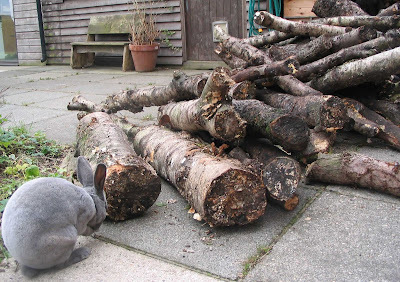 Now I have a good log pile, I can light the wood burner. Its so warm and cosy having real fire. I wood like to heat the house as much as possible in this way so we don't burn too much oil. Its a little too hot for Captain Rupert so he sneaks of to hide behide the sofa. First thank you to Louise @ www.thehomeiswheretheheartis.blogspot.com for the Schmooze award and www.katherinesdream.blogspot.com, for another award which does not seem to be showing up in the side bar where I placed it, (I will look into that). I was really honoured to receive these. I had never had an award before. I should pass them on because I thought it was so nice, but I'm going to cope out as I could not possible decide. Thank you and sorry its taken so long. 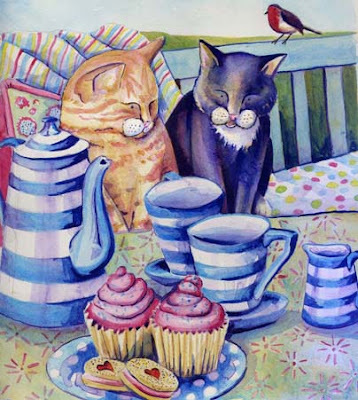 These cats I found having a really good natter and enjoying tea for two on one of these sunny Autumn days. I could not help over hearing a Little of there conversation, ones Kittens had been being very naughty and messing about with her knitting. The other cat had much sympathy and was very glad her Kittens had left home and told great tales of far flung places she gets letters and postcards telling her about great tasting mice from all corners of the world. Little Mr Robin who has been flitting around the garden with Mrs Robin enjoying all my digging for my raised beds, is really hoping to for a little crumb of the wonderful cupcakes. I do hope the cats just share a little with him and give a piece with pink icing on to take back for Mrs Robin. Especially as I have not been doing any digging as I have been feeling a little poorly.